Great customer service. Communicative the whole time. Table turned out even better than I expected! Making furniture with hockey sticks! Like many others, I started out with a simple coffee table. I loved the challenge of building with sticks and began to make nightstands, clocks, benches, chairs and other items. I've been loving it ever since. Welcome to Hockey Stick Builds! 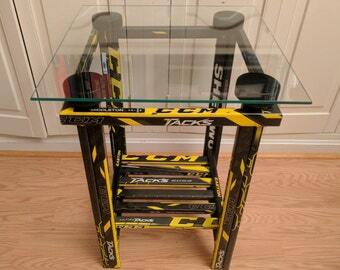 Recycling hockey sticks into custom hockey furniture and clocks. I want to be sure you are completely satisfied. All returns are accepted with a 100% refund for non-custom items. Custom items may be returnable; please contact me. Buyer is responsible for return shipping fees. Credit card or PayPal happily accepted. Shipping to Canada and other international destinations available for all items. Custom orders are welcome and encouraged! Contact me and we'll get started on making that one-of-a-kind item. All products can be personalized. I'm happy to work with you on stick colors, teams, custom pucks, etc. Please send me a message.